As there is now general awareness among people all over the world about the harmful effects of global warming and the state of the economy at present being what it is, they are searching for cheaper options to meet their energy requirements. Although solar energy is an excellent renewable and pollution-free power source, many people are apprehensive of harnessing that energy because of heavy financial implication. One practical solution could be to purchase fragmented, faulty or damaged solar cells and construct solar cells. However, before undertaking a project of this magnitude, you should be clear about your budget and how many solar panels you are planning to construct. Your decision generally depends on how much power you needs to meet energy requirements in terms of watts or kilo-watts. You can estimate average monthly consumption from your monthly electricity bills for a few months. Once energy requirements are firmed up, you can work out the number of solar panels one should construct. As a rough estimate, 36 solar panels generate 20 watts of electric power in one solar panel. The number of solar cells required depends on the size of panels you intends to make. Once you determined the size of the panels and the number of such pane that you would like to construct, the next step is to collect various materials required for the job. It is more economical to use damaged or defective solar cells than spending money on new ones. Although there defective cells are available in a number of markets, one of the simplest methods to get these used cells is to procure them from eBay. It is not at all difficult to get damaged solar cells, sometimes you can get them from broken solar lights. Alternatively, they can also be obtained from the company that produces highway construction signs or weather sensors. Sometimes these companies prefer to give away the broken cells willingly to anyone who needs them as cost of disposal of these cells is quite expensive. Even if they do not give them free of charge, they sell them at throw away prices, far cheaper than what we find at eBay. In addition to cells other items that are required are wood for housing solar panel and also some “caulk”. A little quantity of solder and a soldering iron are also needed. When building the housing for solar panel, it is better to calculate the extent of space needed. This depends upon the number of cells proposed for a single panel. If required, they can be broken up into smaller portions. 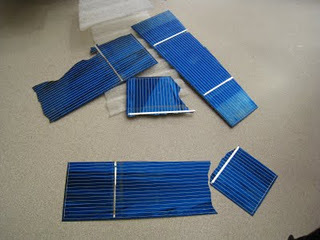 Once the housing work is completed, the next step is to solder individual solar cells into an array. Each array should have the same size. Once the arrays are complete, they should be firmly fixed to their housing and screwed them to “Plexiglas” top. The next stage is to mount the panels. You can mount them on the roof, which is, perhaps, the simpler option. Panel should be fixed to the roof jousts with a bolt. If this is not possible, you can use a ground mount. They are available in many hardware stores. They can also be made at home. I have heard and recently read about the fact that making these are more likey to catch fire. This will also make your home owner insurance invalid.